Kimwood Machinery Inc. offers the STATE-OF-THE-ART in wide-belt sanders. Kimwood's impressive history of successful installations has made Kimwood sanders the standard from which many others are judged. Dating back to 1960, the basic design philosophy for all Kimwood equipment continues today.... a heavy duty machine capable of combining high production while producing the finest sanded panels in the industry. Our ongoing policy has been one of product and service commitment to the forest products industry. Click the following link to check for "New or Reconditioned Equipment" currently in stock. The Panel Master line of sanders was introduced to the industry in 1983, replacing the American Series sanders. Like the American Series, the Panel Master was primarily designed for sanding OSB and plywood. Portions of the Panel Master were also based on the original Kimwood Smithway and Control Master line of sanders. The Panel Master is available in 4' to 5'-6" widths with each width equipped with a variety of sanding head styles depending on the specific application. Opposed Contact Heads: Panel stock removal is equalized between the two heads. Offset Combination Heads: Consisting of a smooth steel contact roll followed by a flexible platen bar, the combination head is used for additional sizing and finishing of one side of a panel at a time. By cutting away the coarse grit scratch marks with the contact roll and wiping only the fine grit scratch marks with the flexible platen, the combination head can create an extremly "flat" smooth chatter free finish. Offset Platen Heads: Consisting of a flexible platen bar, the platen heads are used for very fine finishing of one side of the panel at a time. Generally limited to .001 to .003 inch stock removal. Opposed Contact heads are capable of individual height adjustment via eccentric cams which are mounted on dovetail slides for ease of maintenance. 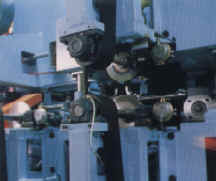 Offset Combination heads have both height adjustable combination contact rolls and flexible platen bars. The combination head is backed up with fixed backup rolls. For ease of maintanence, the combination head units feature dovetail slides. All sanding head motors use banded "V" belts to drive high speed jack shafts featuring short coupled universal drive joint assemblies which are connected to the contact rolls. This allows the contact roll to be vertically adjusted for varied stock removals and different belt grits while maintaining a positive driving torque at all times. Kimwood has been involved in the manufacture of sanders for the wood products industry since 1963. Through the years, the sanders have continually been updated to accomodate specific industry applications which characterize the everchanging industry. As the applications have changed so have certain areas of the sanders. In some cases, Kimwood has introduced new models to meet new applications or modified existing models simply to remain competitive in the industry. Irregardless, Kimwood sanders remain the leading sander in the industry today. Click "Sander Retrofits" for available sander upgrades. The Roll Inventory Program was introduced in September of 1999 when Kimwood began stocking rolls that were in the highest demand. Kimwood has now implemented a revised program that will increase the number and type of rolls held in inventory via component stocking rather than assembled rolls. Component stocking will allow more individual roll parts to be placed in inventory which are used on multiple roll assemblies. This will be advantageous and will increase our ability to meet the high demand rolls needed to help customers during downtime situations. Click "Roll Inventory Program" for more information. Kimwood maintains historical files for all of it products lines. As a result of this, almost all of the equipment originally supplied can be manufactured from historical files. Kimwood also can reproduce most machine assembly drawings and original manuals for those pieces of equipment. Click "Parts, Manuals, & Assembly Drawings" for more information. Let us look over your present Kimwood Sander and provide a trade-in allowance against the purchase of a new Kimwood Sander; or as an alternative, let us provide a price to recondition your existing sander. Click "Reconditioning Program" for more information.